Smell Chanel No 19, and the first thing you will notice is the intensely green, somewhat earthy note. That effect is created by galbanum, a natural resin collected from several species of flowering Ferula plants, which are native to Iran and the Middle East. The oil is steam-distilled and has a very powerful, green, woody-resinous odor, reminiscent of sliced green peppers and hyacinth leaves. Its verdant notes are immediately apparent in fragrances, while the balsamic-woody facets come through as the composition dries down. Galbanum is a traditional note to give a natural green effect to floral accords like hyacinth, gardenia, narcissus, iris and violet. While on its own, galbanum has quite a brash, roughewn character, it lends a beautiful, natural green effect. Green compositions like like Balmain Vent Vert, Chanel No 19, Guerlain Chamade, Estée Lauder Aliage, and dry woods like Robert Piguet Bandit and Aramis are inconceivable without the green vibrancy of galbanum. 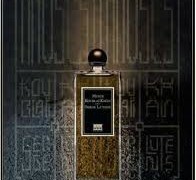 Also, there is a fair amount of this material in Serge Lutens Iris Silver Mist, by Kilian Love & Tears, Atelier Cologne Grand Néroli, and Guerlain La Petite Robe Noire Modèle 2, among the more recent launches. A side note on galbanum, fragrance and politics. When Chanel No 19 was created in 1971, it was formulated with a superb grade of Iranian galbanum oil, which was sourced especially for it. However, when the Iranian Revolution broke out in 1979, the oil became unavailable. No 19 had to be reformulated, which was accomplished with much difficulty, because the original galbanum oil was of a particularly fine, rare caliber. From a culinary perspective, the plant producing galbanum is related to the one producing asafoetida, an extremely pungent gum resin used in Indian cooking. These two gums, galbanum and asafoetida, share several similar components, which are responsible for their pungency and unique green character. Photo of galbanum from anthemis.nl. Marie: Marsi, I had never thought of wearing Chanel no. 19 in the summer – but I definitely will try that. As a matter of procrastination I have already been worrying “what to get” for that season – eventhough it seems far away right now. gautami: I tend to gravitate towards galbanum based fragrances and greens in general. I have had Chanel #19, Silences for a very long time. Last year I also bought L’ombre dans L’eau from Dyptique for its crunch. sweetlife: Just broke out the No. 19 yesterday afternoon, V. Perfect for this winter-bright, almost-spring weather we’re having. Victoria: I am ready for the green, green, green… It feels like that kind of week for me too. It looks like spring outside, but the snow is still here. Mimi: I, too, thank you for a great and informative read. I always wondered what happened to Chanel 19. I still wear it and love it, but it isn’t the fabulous scent it was in the 70s. My own aside about the Iranian Revolution is that I was dating a man whose father was a hostage. I always blamed the Revolution for the loss of that relationship. Now I find it caused an even greater loss with Chanel 19. Victoria: Chanel No 19 has been reformulated many times since then, and the person who shared the story of No 19 and Iranian revolution said that after 1979 it has not been the same anymore. I still love No 19, but it makes me wonder what I have missed. Judith, London: When I first started smelling perfumes I got green peppers a lot, for instance in Bandit. We used to have a tomato and green pepper salad at home, it was salty and slightly acidic, and that’s exactly what I got. I also got leather as two different smells: sweat and coriander. My nose picks up notes much better now but I rather miss that stage when I found odd things and gradually put them together to make a single accord..